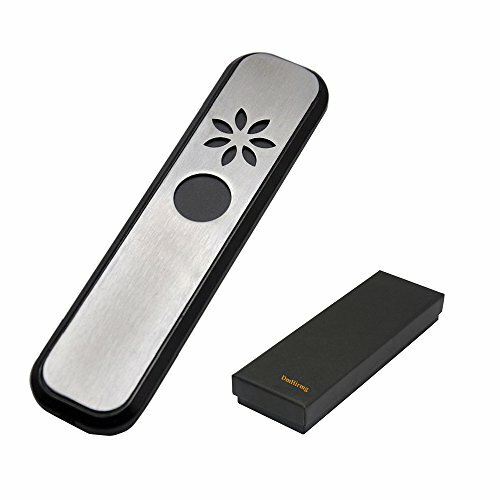 Magnetic Pipe [G-Series] - Thin Profile with Magnetic Slide Metal Dry Herbs Pocket Kit by DmHirmg (Black) by DmHirmg at Serious Jones. Hurry! Limited time offer. Offer valid only while supplies last. Notice!! ONLY the orignal brand DmHirmg sold by BesTim Digital, all other sellers bellow our products is fake products with poor quality, we don't responsible for their quality problerm ,pls confirm this before you buy ! The Pipe combines advanced technology and elegant design to deliver a unique and best-in-class smoking experience for dry herbs. Design contains a dimpled air-filtration chamber to clean, diffuse, and cool down smoke as it passes from bowl to mouthpiece. The magnetic slider (top section) easily slides open to reveal the mesh bowl. Premium CNC milled Aluminum is durable and can be fully submerged and soaked for a thorough clean, allowing for a clean smoke every time. If you have any questions about this product by DmHirmg, contact us by completing and submitting the form below. If you are looking for a specif part number, please include it with your message.